Today is sort of a sad day. My husband & I are trading in his red Porsche Boxter. We love it and have lots of memories in that car. But, its not practical and there's no room for a baby (in the future). Ironically, I was searching through my pro lab and found this amazing photographer named Michelle Reed. She is in Naples, FL. Her wedding work has graced the covers of many bridal and photo magazines! Well, to my surprise Brandt called her and scheduled a private class this July!!!! AAAH!!! I'm so excited! I love networking with other photogs' and I can't wait to absorb her knowledge! So, my porche photos pay homage to Michelle's work. 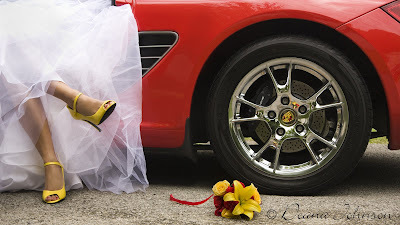 She has a red porsche too and shot a fantastic photo of a bride with her little red car. So, I thought I'd give it a try, put my twist on it, but use myself in the image. OOH Last but not least...thank you Ky Mtn. Bride for the dress and shoes!!! I love Kaye & Connie. They have gorgeous dresses, shoes & accessories. Check out their website under our Links section of deanajohnson.com.